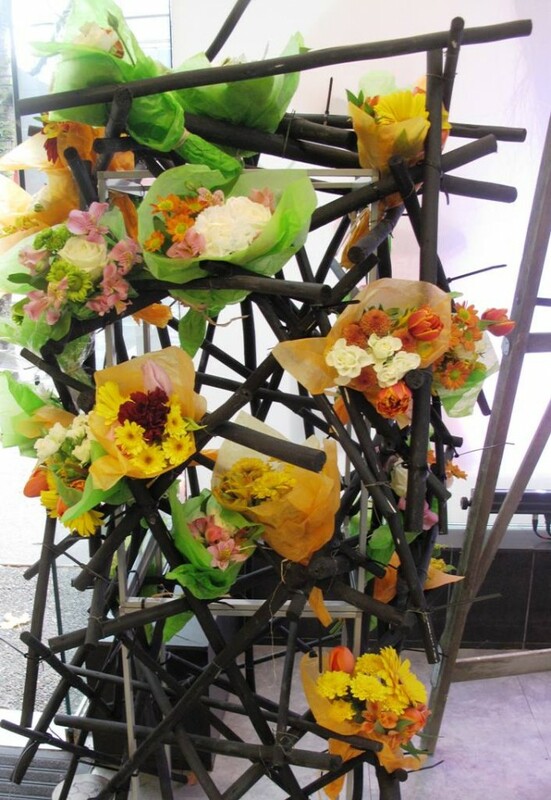 Floral Art Pop Up Shop beautifies downtown Vancouver, B.C. 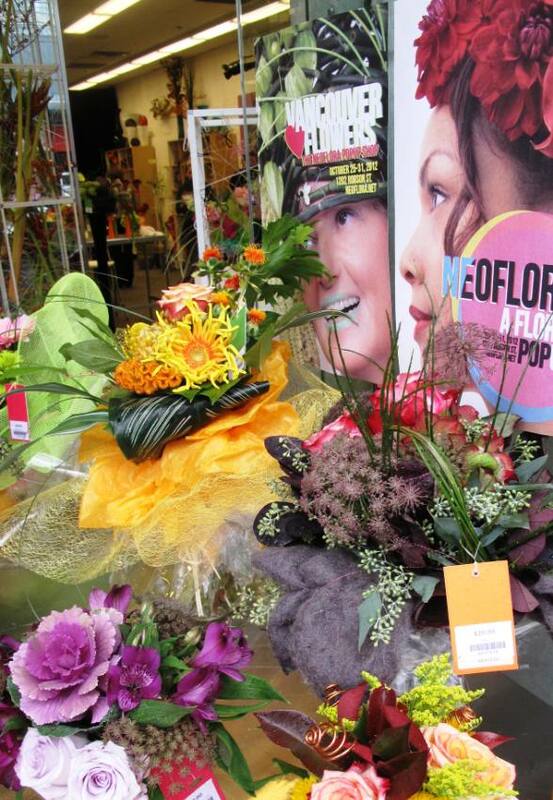 A busy street corner was home to a one-week floral design popup store in downtown Vancouver, B.C. I stumbled across the NEOflora badge on Facebook when I noticed that the very talented Arthur Williams, a Denver floral designer and owner of Babylon Floral who is profiled in The 50 Mile Bouquet, posted a comment that he was going to attend and contribute one-of-a-kind designs at the event. A little digging led me along a trail of links, where I discovered the news that NEOflora was taking place over a seven-day period at the end of October. And as it turned out, I was heading north to Vancouver for a few days last week. When I arrived last Monday, there was no chance of missing the storefront. 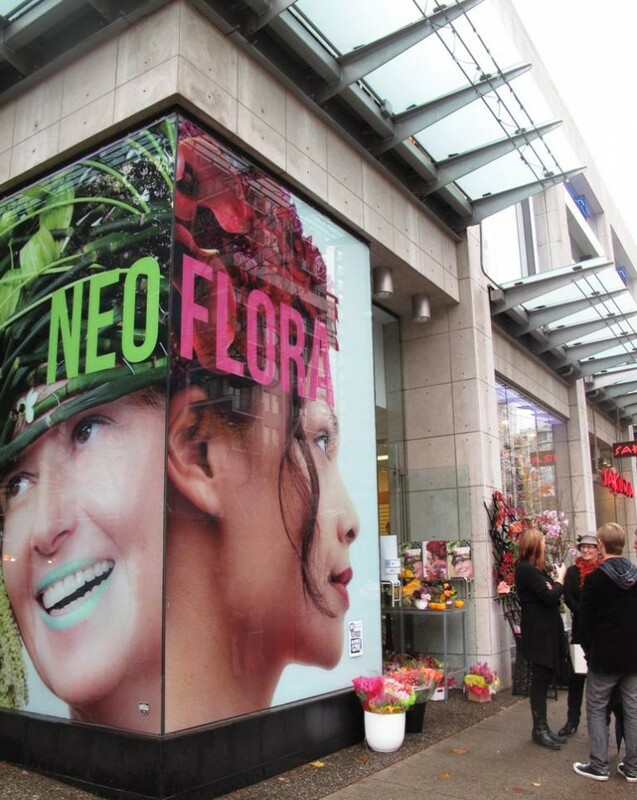 NEOflora’s location on a very busy street corner allowed the creators to hang huge floor-to-ceiling photographs in the windows depicting models wearing gorgeous floral headdresses. The energy spilled out of the store onto the street, drawing curious shoppers inside where they were blown away by the color palette, the incredible variety of botanical ingredients, and the verve of the designs. Everywhere there was a floral artist creating a new piece. The windows and walls were adorned with sculptural installations of flowers, branches and other natural ingredients. Down the center of the space was a traditional black-skirted fashion runway filled with huge vases of flowers. Three floral fashion shows were staged during the week-long event, featuring events for the trade, the public, and the bridal audience. Check out NEOflora’s Facebook page for video clips and photos of these events. Along with Hitomi, I met several inspiring floral artists that day – and I hope to follow up with them in the future to write more about their work. The pop-up store draws attention and helps to elevate flowers and the artists who work with them from a commodity-based product to a highly-valued work of art. One hundred floral designers from Canada and around the world have come together to help fund the one-week pop-up store; donations, fashion show ticket sales and floral sales also helped to pay for the short-term shop lease, which cost $25,000 (CAN) for two weeks. 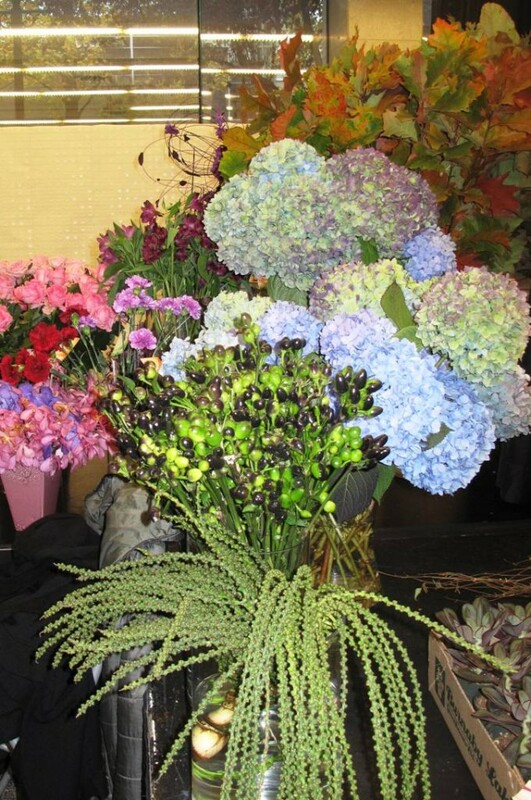 Most of the flowers used in the store, and those featured on the runway, were donated by several members of the United Flower Growers Cooperative, the major wholesale flower auction house based in Vancouver. When I asked Hitomi about the emphasis on locally-grown flowers, she said about 90-percent of the flowers used in NEOflora’s pop-up up project were BC-grown. 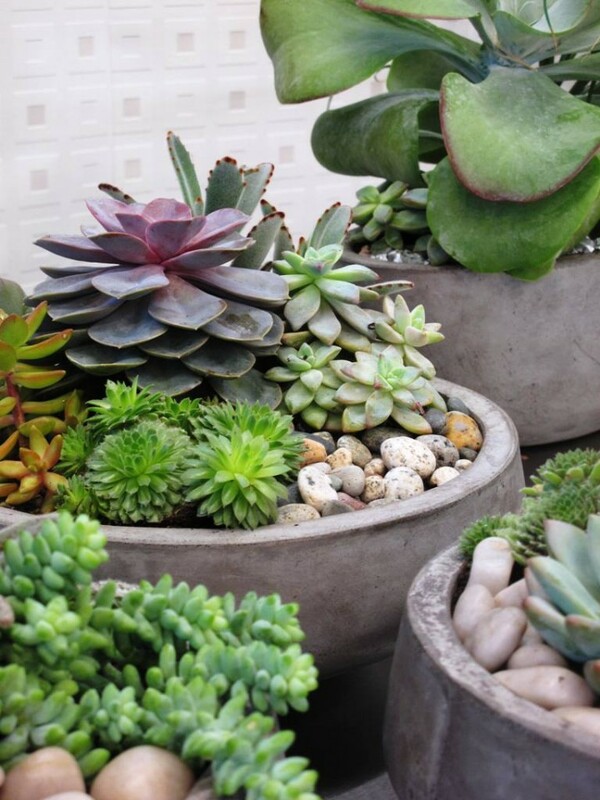 Succulent bowls, featured inside the NEOflora shop. The consumer interest in living arrangements is on the rise. Hip signage and pre-made arrangements drew pedestrians into the store. 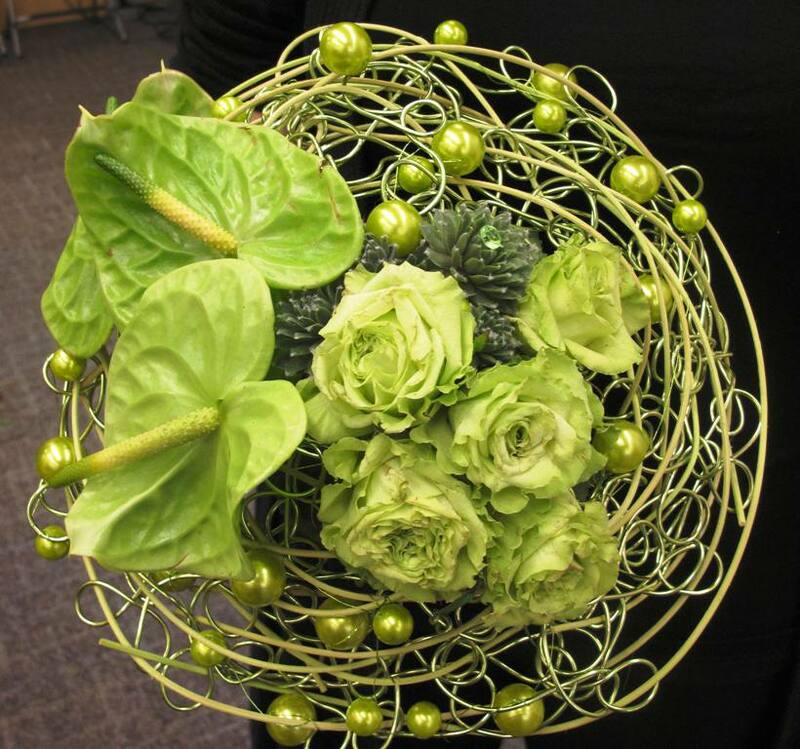 Alexis MacLeod, owner and designer at Simply Perfect Flowers in Abbotsford, BC, created this gorgeous, green wired bouquet. Here’s the takeaway for all my LOCAL FLORA friends – growers and designers alike. Let’s take a page from the talent in Vancouver and bring flowers to the streets of America’s cities. 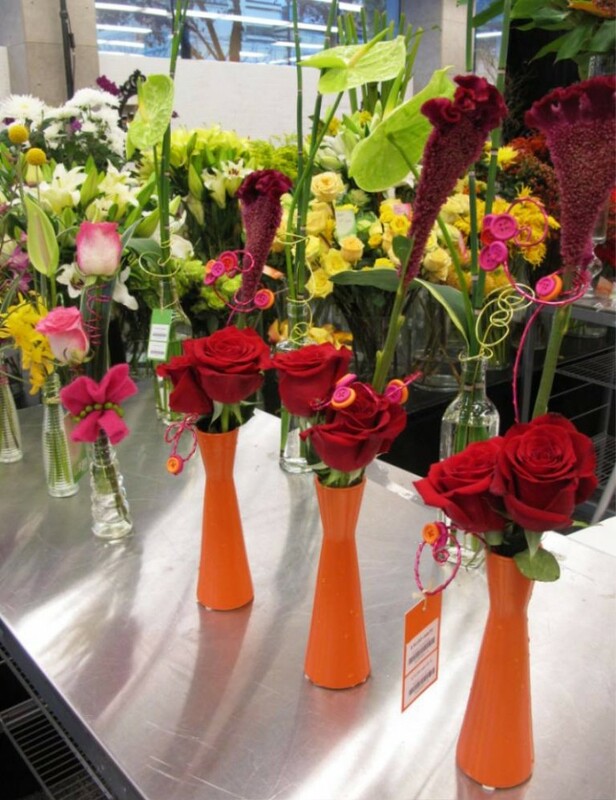 This is a great model for promoting American-grown flowers and elevating the art of floral design to its rightful place in the fashion world! It was great to read your blog on NeoFlora! I am sorry I missed you on the day you came to interview Hitomi. She is the mastermind behind all these great events that I am able to take part in. As a local floral designer that get’s to work in a flower shop, freelance and teach, I am very lucky to be living in a suburb of Vancouver that has so many talented floral artists. NeoFlora was a huge undertaking and it all came together with the help of many dedicated, extremely hard-working individuals. It was definitely a collaborative effort. Thank you for taking the time to come out to visit us at NeoFlora and to write about it – to help spread the word. Everyone at NeoFlora really appreciates it! 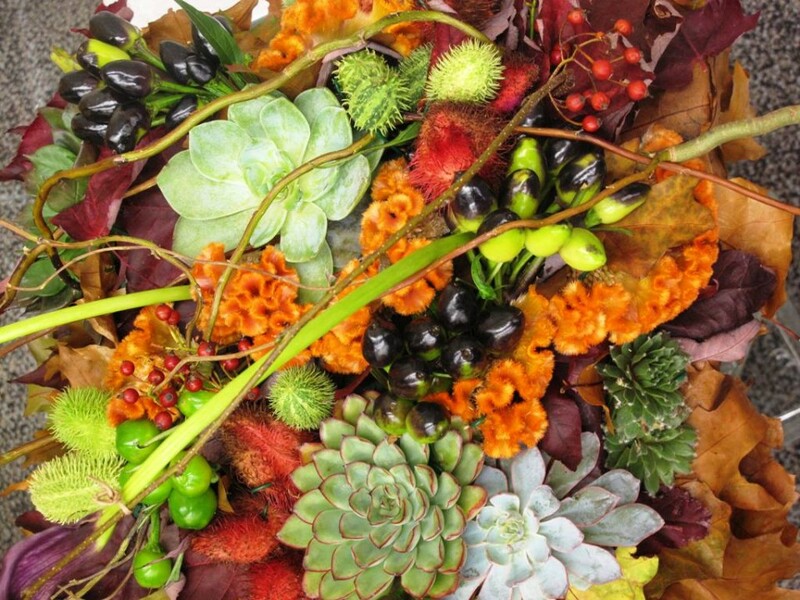 Previous post: Watch them grow: Great news for Northwest flower lovers!